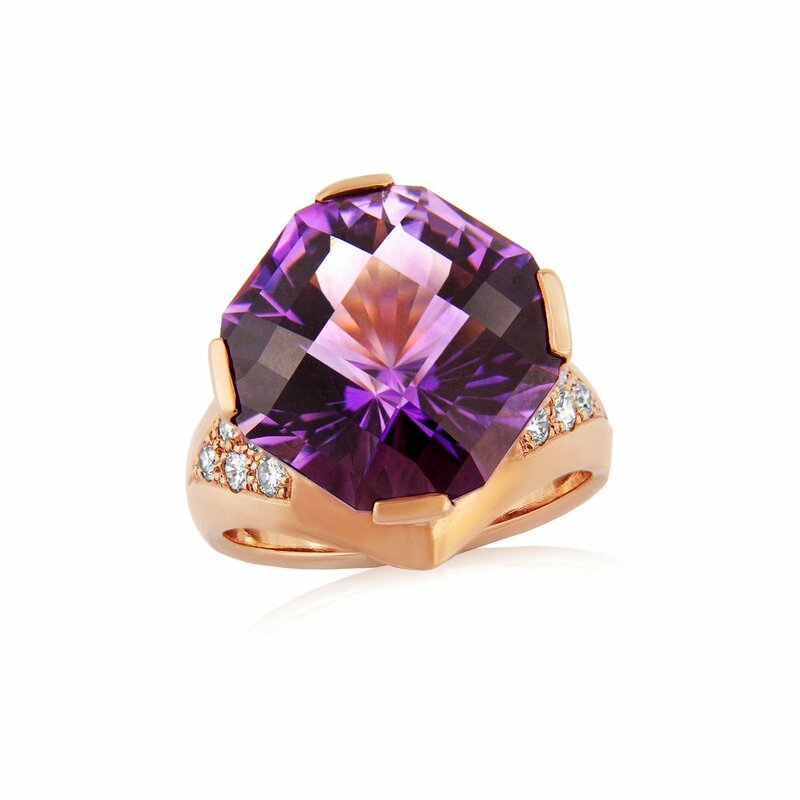 Diamonds and 15ct Amethyst in rose gold, the stone has been diamond cut in a very modern style and this has allowed the stone to really do its thing beautiful. The ring is hand carved in wax and then cast into rose gold with diamonds set into the shoulders, to finish the design and then we added 2 Diamonds at the bottom of the ring as it comes to a gentle point. Solid Australian black Opal with Diamonds Sapphires and Tsavorite garnet in 18ct gold in a band style ring simple to wear and can be beside a wedding ring or other . Rainbow Sapphires make up the circle of colour in this simple and effective open style ring, Diamonds tucked into the side of the shoulder to finish the ring. Blades of Diamonds flash along the sides of the rings main feature, a faceted Welo Opal, the underneath of the mount mimics the cut of the opal in a hand pierced mount. Amazing Welo Opal and Diamond ring all hand made in 18ct yellow and white gold, an effective 2 stone ring which isn"t at all ordinary and really beautiful to wear.